In 2011 Hurricane Irene hit the northeast right on top of a popular wedding weekend. One of my clients had to reschedule her event (luckily I was able to travel to Hawaii to photograph her wedding when their plans were reconfigured!) but my other clients for that weekend decided to persevere and have their wedding regardless of weather! 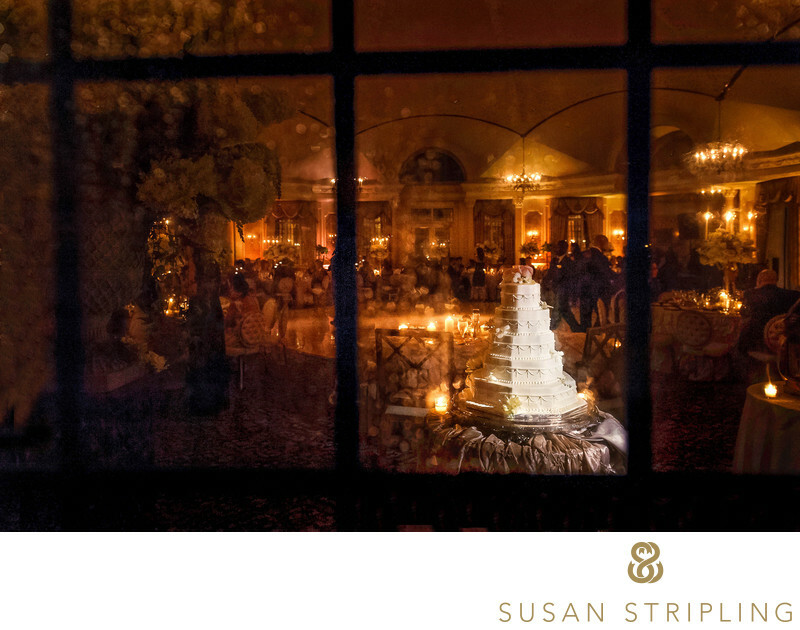 Pleasantdale Chateau in West Orange, New Jersey, opened its’ arms to the bride and groom and made sure that everyone was well cared for despite the ominous skies and relentless rain. Some of my favorite wedding images have been shot in inclement weather, much like at this wedding! While I would have loved to photograph the bride and groom on the perfectly manicured lawns of the Chateau the weather kept us indoors for the entire day. One of my skills as a wedding photographer is the ability to make beautiful images in any given scenario, even if there is a hurricane traveling straight towards us! I was able to work with the exquisitely appointed interiors of Pleasantdale Chateau and combine that with the weak light filtering in through the windows to make gorgeous indoor portraits for the bride and groom. By the end of the night the party was in full swing and when my coverage drew to a close I knew that I wanted to make one more picture before packing up my gear and venturing into the rain. The wedding cake had been placed right next to a set of gorgeous glass doors and I had my assistant stand just to the side of the cake with our video light in order to illuminate the cake even further. I went outside and stood in the rain in order to photograph the rain streaking down the glass. My desire was to show the wild weather outdoors juxtaposed against the warmth of the celebration indoors. This was one of my favorite photographs of 2011 and was well worth getting totally soaked in the rain to make it! I have loved photographing weddings at Pleasantdale, ever since this first rain-drenched event! It's been a joy to get to know the staff there, see how much they care for their clients, get to know the many amazing photo locations around the property, and capture more images for clients on such an important day in their lives! The winding path from the gatehouse up to the Estate - especially marvelous in the fall and winter! The waterside gazebo, especially in the fall and spring! The Music Room, with huge ceilings and elaborate beams. 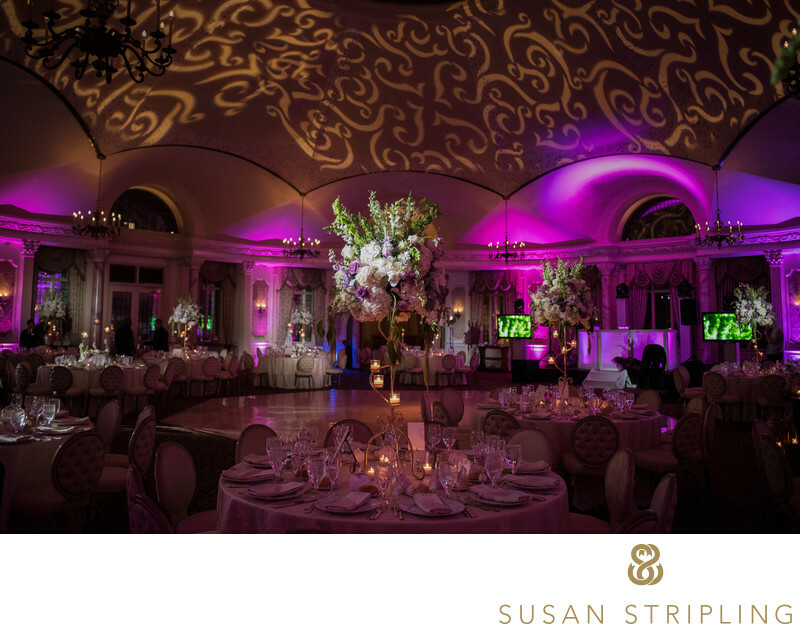 The Grand Ballroom, with a towering glass dome and arched ceilings. The Orangerie, a lush indoor greenhouse. The brilliant bright blue tiles and glass dome in the poolhouse. "It is dark in the reception hall and some of the estate, which we love, but will that pose a problem for wedding photography?" "What do we do if it rains? We love the grounds and want to make sure we get lots of photos there!" I love it when couples voice their concerns, because it gives me a chance to reassure them that everything will be great! I've been a wedding photographer for almost twenty years, and I've photographed everything from weddings on beaches in pitch darkness to portraits outside with pouring snow. 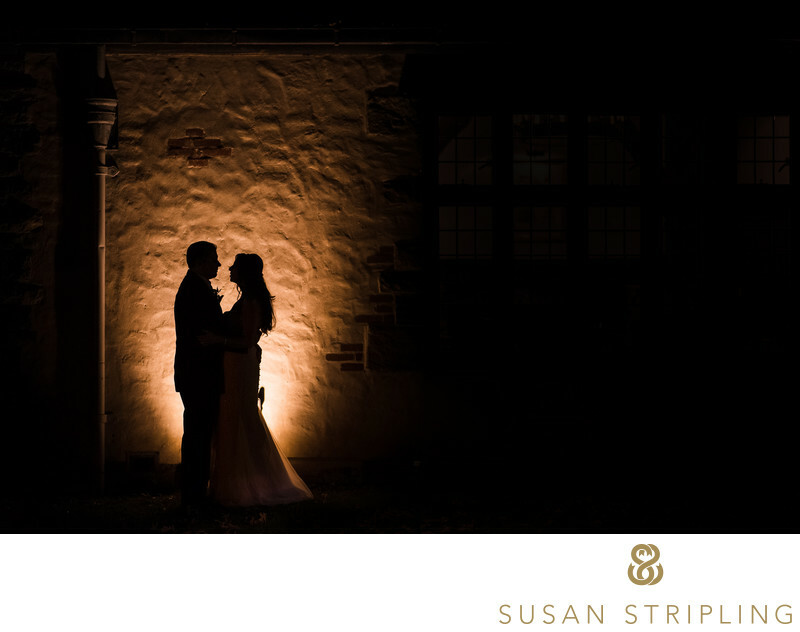 One of the hallmarks of my wedding photography style is my use of light. Whether it's from a window, the sun, or an artificial light source (such as a flash, a strobe, or a video light), creating beautiful light in all types of locations is something I am very good at. I love dark ballrooms just as much as I love the bright sun at noon! If it's dark, or if it rains, trust that we will be able to create images for you that are just as beautiful as if it's "ideal conditions." In the rain, the indoor greenhouse and pool area serve as an amazing backdrop for photographs. There are beautiful windows in a tiny conference room across from the pool that let in the most exquisite light, even in the pouring rain. 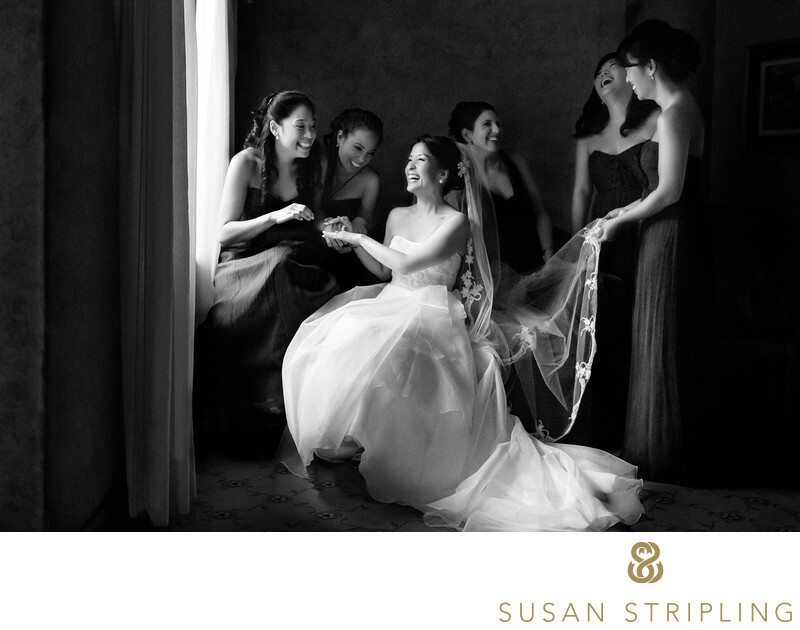 Even the getting-ready suite has wonderful light on the rainiest of days. If you get married at Plesantdale, you're guaranteeing that you have an excellent rain plan. If any part of your day is moved inside for any reason, you will still have incredible wedding pictures. Please do let me know if you'd like to see any galleries of weddings that took place in the rain - I'd be glad to share! Pleasantdale is a great venue for nighttime portraits, too!If you are getting married at Pleasantdale Chateau, I'd love to hear from you! 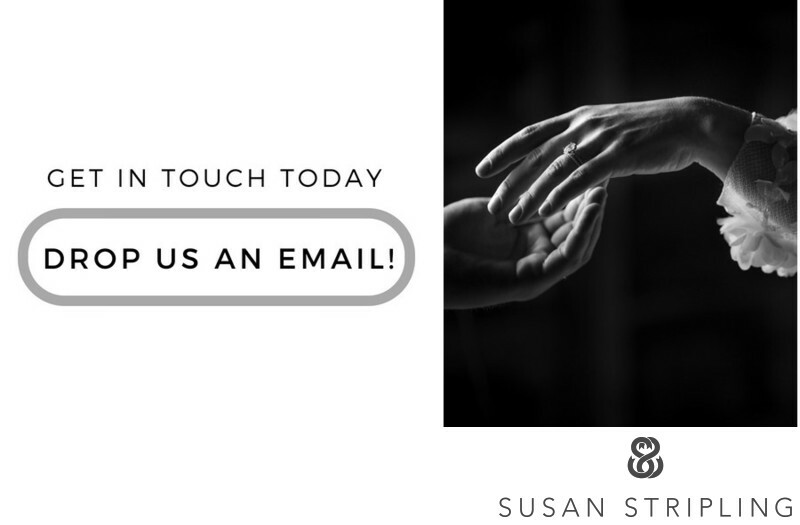 I'd love to talk about your day, and learn what you envision for your wedding photography! Keywords: Pleasantdale Chateau (6), West Orange (6). 1/80; f/4.0; ISO 6400; 24.0 mm.